The electric supply in Portugal is common to most of the European countries. 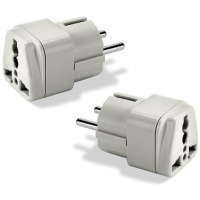 So, throughout Portugal you may expect to find a supply of 220 volts with 2 pin wall sockets at a frequency of 50 Hertz. For the European countries that utilise 240 volts, like Ireland and UK most electrical equipment will function properly in Portugal. But if you intend to use the UK electrical plugs then you will need an electricity plug adapter that will convert the standard 3 pin socket into a 2 pin socket. If you come from the US and bring your own electric equipment, you will need a transformer in order to step down the voltage to 110 volts. Please beware that damage to the electrical appliance can, and probably will, occur if you attempt to use a 110 volts rated electrical appliance with a 220 volts supply.